Srinu Vaitla’s last two films Aagadu and Bruce Lee were major fops at the box-office, and he has not commenced any of the projects later. Now, the director seems to be determined to regain the successful director tag with his next. 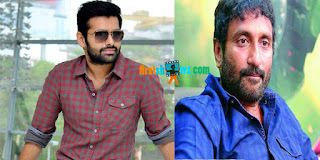 As informed earlier, Srinu Vytla will be wielding the megaphone for a movie starring Ram. This is their second collaboration after eight years after super hit Ready released. Ram has listened to the story line narrated by Vaitla and has given his nod, and the director is busy finalizing the script. Ram is back to success zone with his recent release Nenu Sailaja, and he has chosen Vaitla for his next outing. Can Ram and Srinu Vaitla repeat Ready magic at the BO? Let’s wait to see for more details.